Here’s a fresh take on avocat vinaigrette, a popular starter on bistro menus when I arrived in Paris 40 years ago. In the original, avocado halves were filled with a thick, mustardy sauce. 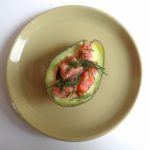 This version is both lighter and prettier, the pink-orange of smoked salmon contrasting with the pale green of the avocado and darker green flecks of dill. Although it has the look of spring, it can be made in any season — and it’s incredibly quick to prepare. This recipe works best with thick-cut smoked salmon. I experimented a lot before settling on the right proportions for the sauce, which combines olive oil with fresh lemon juice. A halved clove of garlic immersed briefly in the sauce adds depth, and a good dose of freshly ground black pepper adds bite. There are many other possible combinations, however. A simple one would be to substitute lime juice and fresh cilantro for the lemon juice and dill. Or you could use a milder oil, for example sunflower or grape seed oil. For an Asian twist, combine peanut and sesame oil and add lime juice, grated fresh ginger and lemongrass. Vegetarians can omit the salmon and double the quantity of herbs. Whichever version you choose, set aside a small quantity of fresh herbs to use as a garnish on top. One avocado half per person is sufficient as a starter, but what if you’re home alone with a ripened avocado ready to eat? Treat yourself to both halves as a light lunch dish. And now some food for thought (but not for the faint of heart). I recently posted a recipe for lobster risotto, which called for either live or frozen lobster. From now on, I will more likely use the frozen variety. This choice is based on a report in Le Monde that Switzerland has banned the boiling of fresh lobster on grounds that they deserve a kinder end. Click here for a BBC summary on the best way to achieve this. Although I have not purchased a live lobster in more decades than I can remember, mainly because of the price, I found this article noteworthy. At a time when concerned citizens are becoming more attentive to animal rights, foodies can choose to become vegetarian — or, if they prefer to remain omnivores, as most humans have been throughout the millennia, they can adapt to a modern way of thinking about our fellow creatures. Dear readers — each time I post a new recipe on this blog, a few people unsubscribe. I hope this foray into an area rarely touched on here will not spark a mass exodus. The point is that, as noted at the top of this page, The Everyday French Chef is ‘the modern cook’s guide to producing fabulous French food’. Today, let’s put the emphasis on ‘modern’. This entry was posted in 1. Starters and tagged avocado, lobster, recette, recipe, saumon fumé, smoked salmon. Bookmark the permalink. Love the blog! But being from New England I’m horrified at the thought of frozen lobster!! Yes, of course — if you live in New England, where lobsters abound, it must be hard to imagine settling for the frozen variety. I spent a couple of summer vacations in Nantucket and happily indulged, for a reasonable price. But here in Paris, live lobsters can cost more than 100 euros a kilo at farmers’ markets, and they tend to show up mainly in holiday season. You can get less expensive lobster in Brittany, but that’s a long way from Paris. So I was quite delighted when frozen lobster tails (langouste) suddenly appeared here this winter. It’s not the same — I grant you that. But it’s surprisingly excellent. As I do every two weeks, look forward to your posts. I enjoy your commentary and I enjoy the recipes you include. Homemade mayonnaise recipe/video is one of my favorites. While simple to make was challenging in the beginning. Now, with practice I consistently get great results. Never again store bought mayonnaise. Delighted to hear this, Joe. And Anne, hope lunch was good! thanks for sorting my lunch! Just tried your Poireaux au Gratin for dinner with some jambon – delicious and easy to make. In Australia I often used to take an avocado to work for lunch along with some tuna salad to put on it. It’s an excellent light lunch and easy to take anywhere. Looking forward to warmer weather here in southwest France so I can enjoy your more summery recipes. Keep it up.